Whether you are looking for investment from VCs or taking stock of the health of your start-up or app there are certain numbers you should keep your eye on. Monthly active users (MAU) is one of the numbers that can provide greater insights into the overall health of your business. In this post, we will look at why active users are important, what MAU is, how it can be calculated, and why it is a useful metric. Why are active users important? From a business perspective, it is important to know that your app is actually being used and is useful to your customers. Active users indicate that people are interacting with your service or product. A healthy number of active users is therefore a sign you are doing things right for your users. Determining the number of active users over time helps with assessing the effectiveness of your marketing campaigns and the customer experience. It is also important in calculating other key metrics. For example, the lifetime value of customers cannot be calculated without knowing your retention rates, and customer retention rates rely on data on whether users are active over time. So, to put it simply, the number of active users provides a measure of the general health of the business and serves as a basis to calculate other, more informative metrics. 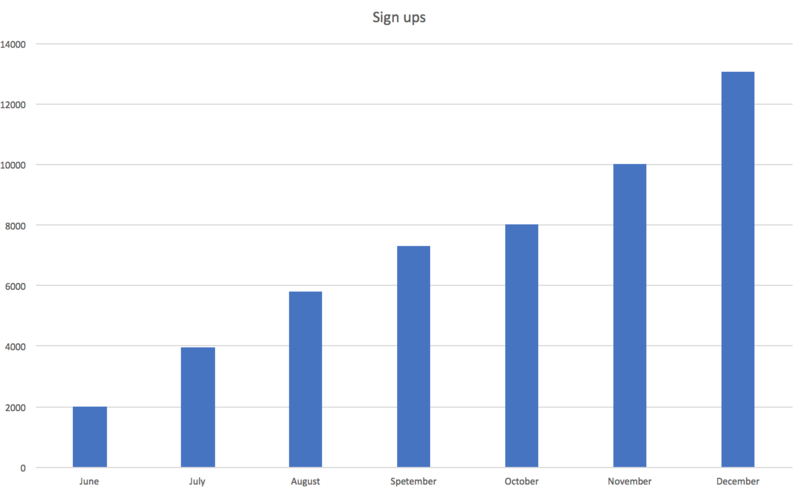 Monthly active users (MAU) is the number of unique users who have performed some action in an app within the last month (30 days). Let’s dive further into this definition and look at the three components that determine MAU. Users: In calculating MAU, every user who performs any action in the app during a 30-day period is counted only once no matter how many times they have logged in and performed various actions. Action: What actions qualify a user as an MAU? Is it a performing a particular action such as liking a Facebook post or logging in/opening the app? In most instances, it is opening an app, which allows for easier comparison to other apps and businesses. Time frame: The last month or 30 days leading up to the date for which you are calculating MAU. In other words, MAU can also be defined as the number of unique users who open the app within a 30-day period leading up to the date for which you are calculating MAU. Unlike other metrics, MAU provides an indication of an app’s performance over time, with performance based on being able to attract and retain users. For example, looking at downloads month over month as in the graph below could lead you to believe that a products user base is growing. 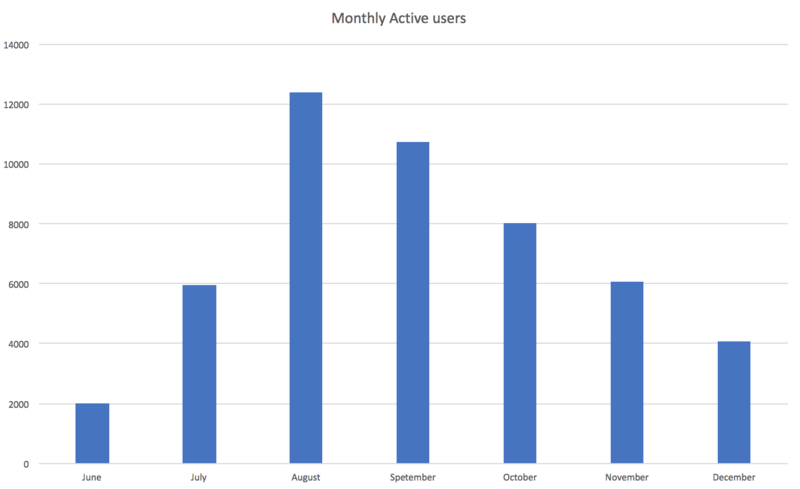 However, looking at the graph for monthly active users paints a different picture. The number of active users is considerably lower than the number of downloads, and the app seems to be losing active users over time. Let’s say you were looking at monetizing the app with advertising. The number of monthly active users presents the total number of users that could be monetized. Why is MAU a useful metric? For VCs looking into invest, knowing the DAU/MAU ratio is important. Why? Because they are looking for indicators of stickiness (how many users are repeat users of the product) and signs of growth. If there’s one number every founder should always know, it’s the company’s growth rate. That’s the measure of a start-up. If you don’t know that number, you don’t even know if you’re doing well or badly. The best thing to measure the growth rate of is revenue. The next best, for start-ups that aren’t charging initially, is active users. That’s a reasonable proxy for revenue growth because whenever the start-up does start trying to make money, their revenues will probably be a constant multiple of active users. To measure the stickiness of your product, the Daily Active Users/Monthly Active Users (DAU/MAU) ratio is often looked at. It provides insight into the number of monthly active users who engage with your product in a day. MAU is an easy-to-calculate and easy-to-compare metric. However, it does have issues, and some have talked about retiring the use of MAU. While retirement isn’t necessarily the best approach, it is important to be aware of these main issues. It is an unreliable metric for just-launched start-ups – Putting stock in MAU early in a start-up’s life is a mistake. Given the definition of MAU, all of the promotional activities that are associated with a launch such as PR, being featured in app stores and publications, word of mouth, advertising, etc., can highly inflate MAU figures. It would instead be better to assess MAU once traffic has normalized over a few months. Depth of usage isn’t accounted for – To qualify for MAU, according to some definitions, a user just has to log in and doesn’t need to engage with the product beyond that. So having a high MAU doesn’t necessarily mean that all those users are engaging with your product. From a monetization point of view, you can only monetize users who engage with your app. So it’s good practice to measure unique users who interact with a core feature of your product. Quality of users isn’t accounted for – Not all users are the same. Users obtained from different sources tend to exhibit different engagement behaviors. Some sources, for example, may allow for installs quickly or cheaply, but if those users don’t engage with key features of the product then the source isn’t very useful. In fact, obtaining a large number of users from such sources only serves to inflate MAU numbers but does not provide much else in value. What do changes in MAU mean? Over time, MAU figures will change depending on the rate of acquisition of new users, retention rates of existing users, and the reactivation of lapsed users. So, what do increases or decreases in MAU indicate and how can they be used by a start-up? This tends to happen when the number of new users and reactivations is greater than the number of existing users that have churned. New users – A new advertising campaign, positive press, or the app being featured in the app store can drive an increase in downloads and new users; in turn, they drive an increase in monthly active users. Reactivations – Start-ups that have a large base of users that are no longer active can reactivate them via email campaigns or push notifications. Churn – Addressing issues which have put off users via a new release or feature can reduce churn rates among existing users. This, in turn, would help increase MAU. A decrease in MAU occurs then the number of new users and reactivations of existing users is less than the number of existing users that have churned. New users – The number of new users may fall due to expiring subscriptions, reductions in advertising or promotions, or the app no longer being featured on publications or in app stores. Churn – An increase in churn rates due to technical problems, features that put users off, or other issues can cause an increase in churn rates, which in turn lead to lower MAU. Now that you know how MAU can be useful and how to calculate it, you can factor it into your user engagement strategy. Knowing how to predict churn and engaging your users via email or in-app messages will help improve your monthly active users and overall user engagement.